After more than two decades of professional acting and university teaching, Margie took her first yoga class at the YWCA with Lisa Belfiori and wondered why all actors weren't learning these practices that so immediately cultivate spiritual presence, concentration, self-discipline, strength, stamina, flexibility, kinesthetic awareness, breath support, stress management and much more. 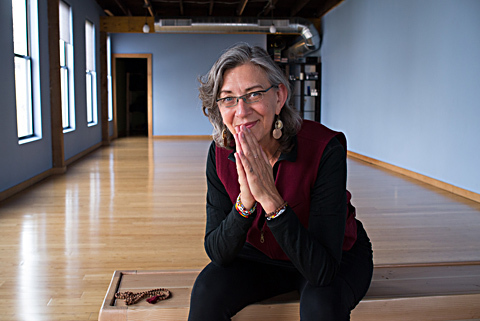 Since 2002, she has been teaching Ashtanga, Vinyasa, Restorative, Partner Yoga and Chanting at One Yoga, A Nonprofit Organization, as well as with the Freshman Company of the University of Minnesota / Guthrie Theater BFA Actor Training Program. She also sees private clients, plays harmonium, leads chanting events, sings with the volunteer comfort choir, Morning Star Singers, and co-leads a yoga and singing retreat in Mexico each March with Barbara McAfee. Margie's extensive background in theatre (she holds a BFA & MFA in Acting), training in hospice and bereavement care, and interest in indigenous traditions and the journey of awakening into presence add a unique dimension to her knowledge and teaching style. Margie's calm, nurturing nature and playful spirit supports students on their journey of self-discovery and transformation. She has explored approaches to Ashtanga Yoga with Sri K. Pattabhi Jois, Manju Jois, David Williams, David Swenson, Danny Paradise, Larry Schultz, Matthew Sweeney, Lisa Belfiori, Kate Thorsen, and Julie Lerner-Schmidt, studied kirtan and chanting with Dave Stringer and Sylvia Nakkach, and been influenced by the teachings of Stephen Jenkinson, Martin Prechtel, Leonard Jacobson, Ram Dass, John O'Donohue, Eckhart Tolle, Michael Brown and many others. "Her class...is a mental, physical and spiritual experience." "Margie Weaver, being a true teacher, creates a learning space where both student and teacher are on the same plane." "...Giving different levels of challenge for all postures so that no matter where you are as a student, you can work your best at that very point." "Margie Weaver creates an open environment that allows each of us to experience and grow...empowered by the movements through breath. Be, learn to listen to our bodies, find the edge, with breath move beyond and fly. These are powerful exercises." "I am already stronger mentally, physically and spiritually..."
"Thank you, Margie. You are a gift!"